Our company is a distinguished Manufacturer, Supplier and Exporter of Brick Cutting Machine from Mumbai, Maharashtra. Our Brick Cutting Machine can be used for cutting different variants of bricks like refractory brick, furnace brick, ceramic or mosaic tiles, etc. Brick Cutting Machine provided by us is designed to be used by foot pedals, which help in reducing operator fatigue. Customers can avail from us two different types of models of this machine according to their operation requirement. 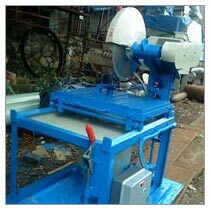 We offer bulk quantities of Brick Cutting Machine at heavily discounted price.